Highly touted Oregon freshman Bol Bol shined at Madison Square Garden tonight, scoring 26 points on 11-17 shooting and adding 9 rebounds in the Ducks 80-65 win over Syracuse in the consolation game of the 2K Empire Classic. Bol scored on an array of floaters inside the key, finesse moves around the basket, put-back ducks and layups, and even hit one of his two three-point attempts. The 7-foot-2 freshman also was poised and passed well in attacking the vaunted Syracuse zone. 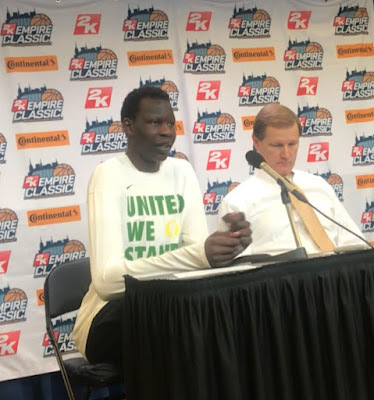 Bol Bol addresses the media after Oregon's win versus Syracuse. Bol, ranked the fourth best high school prospect by Rivals.com (ahead of Zion Williamson), bounced back from a subpar performance Thursday night in a loss to Iowa. Syracuse coach Jim Boeheim, while not happy after his team’s second loss in two nights, had high praise for Bol, as well. Oregon moves to 3-1 and faces Green Bay on Tuesday. Syracuse, who many predicted would be a top team in the ACC this season, drops to 2-2 after two subpar performances from team leaders Tyus Battle and Oshae Brissett. The Orange will face a less formidable opponent in Colgate on Wednesday. “The bottom line is we need to make some threes if we shoot 28 of them, if we’re going to be successful,” Boeheim said of his team’s 5-28 performance from beyond the arc. Luckily for Cuse, there is a lot of season left for improvement. Scarier for the rest of the country, the same thing can be said of Bol Bol and the Oregon Ducks.